Not too long ago, I was discussing different parenting techniques with a friend of mine who has much younger children than I do. We were debating the pros and cons of sending a child to their room for time-out. I was of the opinion that sending a child to a room, their bedroom, might set up the child for bedtime problems, because an area that should be kept for sleeping should be without feelings of insecurity, feelings of anger and despair. It should be a sanctuary, where the child is happy to go, feels comfortable and secure. She turned to me and asked what techniques I used, if I didn’t use time-out and sending the irreverent child to his room, what did I do? And I said – Frog Powder, plain and simple. Her response – Frog Powder, what on earth is that? And that is when I told her the following story. Back when the children were really little, maybe 3 and 5 years of age, they discovered a box, high up on a shelf in the family room. It was completely out of their reach, but they would stand in front of the book shelf and stare at it. It was a box of tea, but for some reason they were drawn to this box, maybe because of the Japanese writing and the detailed painting on the lid. 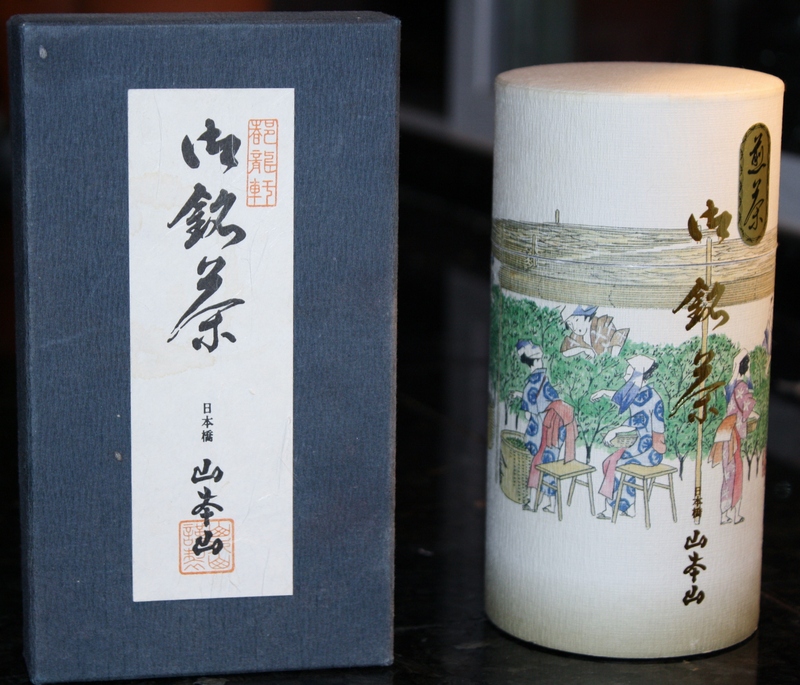 It contained a tea canister with a painting of ladies in kimonos participating in a Japanese Tea Ceremony. When the lid of the canister was open, there was an additional silver lid inside, I am assuming to ensure the tea contained within, remained fresh. I am not really sure what the fascination with this box was, but the boys spent many hours trying to convince me it would be in my interest to let them look at it. But I didn’t want them to look at the tea canister or the box, because I knew it would end up scattered throughout the house and I too really liked the box. So I made up a story about the box, in hopes of dissuading them from pestering me about it. I told them, before they were born, their father and I had travelled way up into the mountains of Japan. We wanted to go see the sacred bridge in Nikko. It was there, after having a momentary scuffle with a Snow Monkey (who reached through our opened car window for a chocolate Pop-tart that was on the dash) we met a very old Japanese woman, who was sitting on a boulder by the river, with a cat at her side. Her face was carved with the lines of time, but her eyes glistened and shone with an undying youth. Prior to noticing the women, we had been admiring the simple beauty of the bridge and listening to the roaring waters of the river running through the gorge, when we realized she was staring at us with an unsettling intensity. I glanced over at her quickly and offered her an obligatory smile. She did not smile back but beckoned to us, nodding her head as she waved her hand towards her. We unwillingly and with great hesitancy shuffled over to her, thinking maybe she needed help. Little did we know, it was us who needed the help. Their father and I both peered at the box, looked at each other and then at the witch. I spoke first. “A box of tea? How will that help?” My husband said, “I don’t understand, what will that do for us?” The witch became quite frustrated with our skepticism and stood up. It turned out she was quite scary at her full height, despite being quite petite and frail looking. She raised her hands to the sky and said, “What is it with you Americans? Must you question everything? Do you not have any beliefs or convictions at all?” Her face transformed with the anger, her eyes became slits and she glared at us. That stare felt like it was piercing our very souls and we both staggered back simultaneously. She dropped her arms to her side and then pointed a finger at us. “This is Frog Powder. It is an ancient powder which I am willing to share with you as long as you are ready to open your hearts and your minds to its power.” At this point, as we stood along the path that led to the Sacred Bridge, we were too frightened to ask any more questions. We nodded our heads and muttered something about being ready to open our hearts and minds whilst secretly hoping she wouldn’t change us into rocks or something inanimate. We were speechless. She handed the box to us, I took it carefully from her. She turned to walk away as we said thank-you. She stopped on the path and turned back to look at us, “Guard this Frog Powder with your lives. It is very potent. Do not let anyone near it. Keep the box up high and away from curious children. One drop of this is all it takes.” And then she was gone. As I told this story to my sons, they sat there in awe, craning their necks to stare at the magical box on the very top shelf. Their eyes were big as they looked at the box and then back at me. They loved that story and wanted to hear it over and over. They never asked to touch the box again, which was really great. But then serendipitously, I discovered another use for the magical Frog Powder. When this all began, and the story of the Frog Powder came to be, we were living in Georgia. It must have been July or August, because we were being treated to a late afternoon, early evening rain. On this particular evening, the rain had come after the sun had set. I went outside to enjoy the cooling air of the showers and noticed the tree frogs were out in full force. My husband was on the patio as well, reading a book and listening to the rain as it came through the grove of pines in our front yard. Without telling him what I was about to do, I picked up a tree frog and cupped it in my hands, walking back inside to the family room. The boys were sitting on the rug, leaning up against the sofa, watching television. I walked into the family and said, “Boys, I have just done the most horrible thing.” They kind of half-looked at me while keeping the majority of their attention on the television (I think Dexter’s Laboratory was on). My oldest replied, “What have you done?” and I said, “Well, I was dusting the bookshelf, you know the one where the Frog Powder box is, (at that point I had both of their undivided attention) and I don’t know how I did it, but I accidentally spilled some powder on Daddy,” the boys were now standing up looking at my hands, “and he turned into a frog.” I opened my cupped hands to show them the tree frog. Needless to say, they flipped out. They were frantic. I really didn’t think they were going to believe me, but they did. I quickly told them I was kidding, but the boys were so upset about it. I had no idea that story had made such an impact on them. Their Dad heard the commotion and came running into to see what was up. He couldn’t believe I had pulled such a rotten joke on them. I apologized and said over and over that I had no idea they would react that way. They eventually forgave me, after about 10 minutes, but they still remember that, even now that they are teenagers. I think the oldest threatened to call me out on Oprah when he was big enough to go on a talk show. But through all that mayhem, we discovered that we only had to mention the use of Frog Powder and the boys would straighten up. Even their Grandmother down in Mississippi had a pot of Frog Powder on her mantelpiece, so if they misbehaved during one of their visits to her, she had some at her disposal. Several years later, the boys were busy playing with their friends. They had come back to the house and asked for buckets. I didn’t think too much of it and gave them two buckets. They happily marched off down the street with their friends, five boys in a row, two of them carrying cleaning buckets. (This is when we lived on a gated military base housing development and things were very safe) An hour or so went by, and I hadn’t seen the boys or the buckets. Now at the time, I had a garden in the front courtyard of the house. It was a beautiful garden, with a fountain, a huge Philodendron plant, with Hostas and lush ground cover surrounding it. It was such a peaceful area, nice and cool, shady and protected (and I have never been able to replicate this in any of my other gardens). I tell you this because the boys came back with their buckets. They were very excited about what they had been doing over the previous hour or so. It turns out they had taken the buckets and successfully captured I think every single frog within a mile radius. Their reasoning behind this was they wanted to bring the frogs back to the lush courtyard garden where they would be safe and protected. I asked them why they needed to do that, not that I really had any problems with a hundred little frogs and toads hopping around my garden. They said they couldn’t take any chances. I said chances on what. All five boys turned to me and quite seriously said, “Chances that they might really be boys spending their week out in the forest.” I was taken aback and had to think about that for a moment. They said at least in the courtyard garden they would have worms and a fountain, and nothing would be able to get them until they turned back into boys. And since there was no way of knowing which frog was really a frog and which frog was actually a boy, they had to bring every single one of them back. How can you argue with that logic? 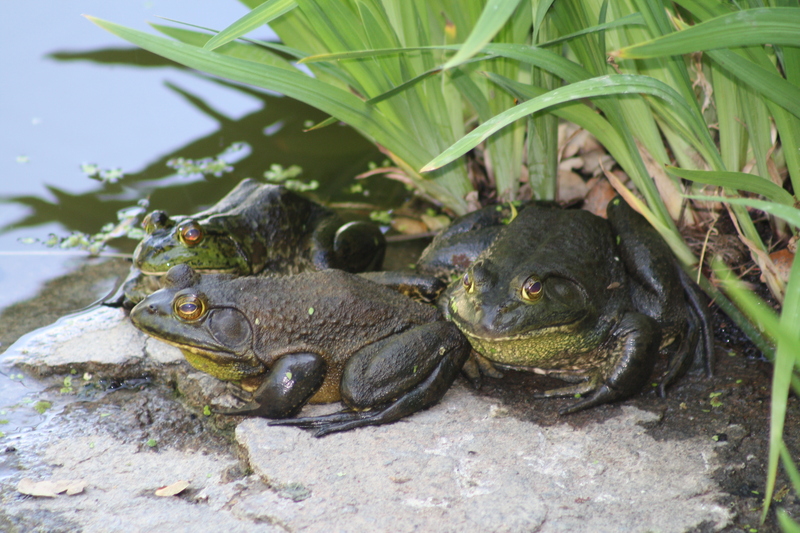 Needless to say we had a veritable froggy symphony in our courtyard for about a week, until the frogs decided to return to their homes. So I finish telling this story to my friend with the younger children, and she is just looking at me like she is considering reporting me to Child Protective Services. She says to me, “How could you have done that to your poor children?” Of course these children are now huge boys, one is 6’ 4”, the other is 6’ 6”. She said, “Don’t you think you might have scarred them by telling them such horrible stories?” I can’t say I was really surprised by this response as it seems we are trying to demolish any magical thinking a child might possess these days, but I did kind of feel like I had done something really terrible and my children would be tormented for the rest of their lives. But I hear parents are now shying away from Mother Goose Nursery Tales and Grimm’s Fairy Tales as well – too brutal for young impressionable minds. What the heck, are we going to take Santa away next because he is rather stoutly and the fact that he is forced to clamber down the tight spaces of chimneys, that can’t be good for his psyche and wouldn’t that be terrible for the little children to even consider? Why aren’t we cancelling Halloween? If you really think about it that is a sick and twisted tradition on so many levels. Let’s dress our little tiny children up like devils or witches and send them out in the cold, windy night to beg for candy from complete strangers. How is any of that right? And so I said all of that to my friend. But we could never agree. She felt sequestering her child to a room (umm, kind of like Rapunzel) was so much better than telling a story and buying into the magical thinking of a child. What are your thoughts on Fairy Tales, Time-Out and other forms of manipulation parents use to keep their kids in check? Haha!!! – my boys didn’t have any problems with nightmares, and for that I am very grateful. Thanks for the comment!!!! Thanks for reading my blog and the comment, Dr. Cohen. Frog Powder worked really well with my boys, at least I think so. This type of parenting techniques might not be for everyone. Of course some parents prefer just saying NO..NO..NO, so much so that their children just completely tune them out, or they fall back on the new stand-by of just handing them an electronic device (I like to refer to these devices as ‘electronic ritalin’) to keep them entertained, or to distract them from whatever they are not supposed to be doing. These two methods don’t do much for teaching young ones anything about choosing between right, wrong and consequences. Again, thanks for all the support. This is hilarious. I laughed so hard at the thought of little boys being so afraid for all the little “transmutated” froggie lives that they gathered them all up. I really am going to be using this, but seeing as we have no frogs in the area, toads will have to do. Haha!!!! I think you could substitute any creepy-crawly thing, whatever you happen to have a lot of in your area. The boys are teens now and fondly remember all those little stories. Let me know how it works for you. Will do. I never think to incorporate things like this. Thank-you. And it really does work! This was thoroughly interesting and fascinating as I read through your story glued to every word. A great way to keep youngsters in check. Just loved it. Thank-you. It worked very well. Of course my kids, who are now teenagers, tell me I was always telling them made-up stories to terrify them into behaving – but in actuality I think they got a kick out of them. I say it is better than screaming at your kids, or threatening them with grounding or going to their room, or all the other ridiculously ineffective things parents try to do – I never had to do any of that. Thanks for coming over to my little blog to visit!!!!!! !